After spending a year in the desert, my son & I were home to stay. My son and I arrived at Fort Leonard Wood Missouri on 6 November 2006. We still had to go through redeployment at Ft. Wood and this could take 3 to 5 days. 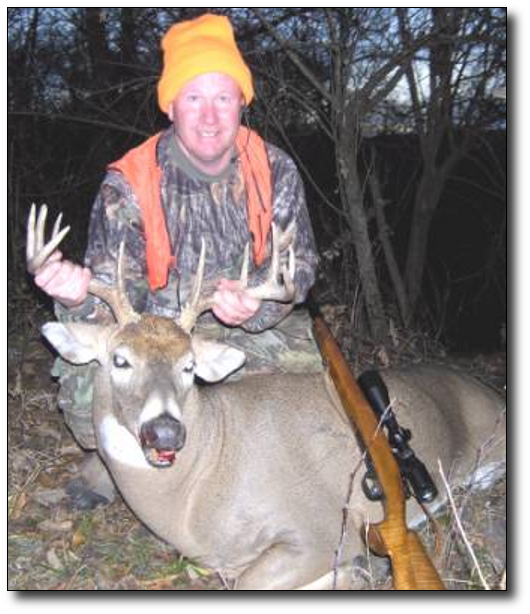 We both were pretty excited that we might get to make opening day of the 2006 rifle season in Missouri. We finally got released on November 9 2006, but we still had to come to Springfield for our homecoming ceremony that was scheduled for 11 a.m. Everything went according to plan and we were released to our families at 12:30 pm. This was a very joyful occasion, we got to see several of our family members that we had not been able to see for a year since we deployed on October 22, 2005 and put boots on ground in Kuwait on 19 November 2005. after a short visit with our family we were headed home with my wife and his daughter, who had stayed with us at Ft Wood for the week we were there. We finally arrived home at 4 pm on 9 November, with lots to do before we could make our 6 hour drive to northern Missouri on Friday morning 10 November. I had bought a new rifle while in Kuwait and wanted to use it this deer season, it was a very nice Mauser 98 that had been sporterized with a gorgeous maple stock in 264 Winchester Magnum. I had to do some reloading and then put my new scope on this rifle, and then sight in the rifle. My son just had to check his zero on his rifle and pack for the hunt. Well I got the scope mounted and a box of 264 Winchester Magnums loaded with 100 grain sierra bullets, these babies were fling mach 1 at 4100 fps. after sighting in my rifle and packing for the hunt, I got to spend some more time with my wife and granddaughter. after a very enjoyable evening with the family and a good nights rest in my own bed we were off for northern Missouri for our first hunt in over a year. We finally arrived at our destination around 1:30 pm on Friday 10 November. Kelly was already there and had his camp set up. My son and I were staying in a motel. It was pretty chilly for my son and me since we were used to 110+ temperatures in the desert, and now it is 32 degrees and sleeting and snowing on us. Kelly brought out the polaris mule and we loaded our tree stands on it and off we went to see if we could find a spot to hunt. I had looked at the property on google earth while I was in the desert and picked a few spots that looked good to place stands on this 900 acre farm. This farm was mostly open with a few ditch lines with timber along them. Kelly and his wife had already placed their stands so we placed ours on a couple of places that looked good to me. We went back to Kelly's camp and Bob had shown up by now also. Kelly loaded Bob up and took him out to put his stands up. Justin (my son) and I headed back to our motel for a good nights sleep and a good supper before our hunt. The morning came fast and we were up and ready to go by 4 am. We had to drive around 20 miles to the farm that we were going to hunt. I was on my stand by 5 am and Justin was on his around the same time. Daylight came and the temperature was in the high 20's and I had plenty of clothes on for the hunt. around 7 am I got my first excitement, it was a coyote at 50 yards, I picked my 264 Winchester Magnum up and settled my crosshairs on his shoulder, but I couldn't shoot him, I wanted a nice buck, so I waited. It wasn't long before a young 6 point buck came along and he was legal (in northern Missouri a buck must have at least 4 points on one side to be legal) this buck had 4 points on his left side and only 2 points on his right. I let this young deer go, in hopes of seeing a big northern Missouri buck. I called Justin on the radio and told him what I had seen, I asked him if he had seen anything, but he hadn't seen anything yet. By 10 am I had seen a few more does and another couple of young bucks on the neighboring property. Justin had also seen a few deer. We both saw a couple of gobblers also. at 11 am I was ready for lunch so I called Justin and told him to make his way to me since I was on the way back to Kelly's camp. Justin made it back to me by about 11:15 am and off we went to camp to see how everyone else had done on opening morning. Camp, the stories begin, well I thought they would, but nobody had seen much all morning. Justin and I had seen the most of all the hunters on the property. Justin was pretty anxious to shoot a deer and wanted to go back to town and get a doe permit, I told him if he was going, to buy me one also. Justin left and then returned around 1:30 pm with our doe tags. We then ate our good lunch, Peanut butter and Jelly sandwiches um um good, hadn't had a peanut butter and jelly sandwich in over a year. You all might think what a lunch but for us it was a delicacy since we had not had any for such a long time. Don't get me wrong the food they fed us in the desert was very good. Every Wednesday we had surf and turf night at the chow hall. This consisted of shrimp, lobster or crab legs and T-bone steak. after our hardy lunch we were off again, it was about 2 pm and we were in our stands by 2:30 pm. While walking to my stand I saw a doe on the other side of the ditch I was hunting, it was about 500 yards away in through the timber that lined the ditch so I could not get a shot at her. around 3:15 the deer started moving around me and there were bucks chasing does in and out of the fingers of woods, but nothing I wanted to shoot. 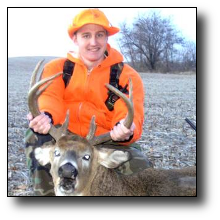 There was one average 8 pointer that was headed for Justin. I called him on the radio and told him to be ready, but he never made it to him. Justin had a 6 point walk right up to him, I mean right up to him 5 yards away! He called me after the young buck had left and told me it didn't matter if he killed anything or not, that little buck made his hunt. Now for the good stuff, at 3:45 I am sitting in my tree watching a few deer on the neighboring property when I heard some brush snapping and steps coming towards me. I picked up my rifle and stood up in my tree stand and about a minute later a nice buck appeared out of the thick brush that was along the 15 foot deep ditch. He was only 30 yards away. Where is my bow when I need it? I put the crosshairs on his shoulder and he stepped behind a tree, with his shoulder behind the same tree. I waited and studied the rack on this deer. It wasn't a great set of antlers but I really didn't think this property would hold a real big buck. This buck was a 10 point about 19 inch spread but his tines were pretty short. I figured he would score around 130 Boone and Crocket point. He took one more step and I took my safety off and squeezed the trigger. The rifle bucked and the buck was on the ground, not even taking one step. I removed the empty case from the chamber and loaded a fresh one in. I sat down in my tree stand and waited for 5 minutes to make sure he was done. He didn't move a muscle, so I unloaded my rifle and lowered it down to the ground with my rope. I gathered the rest of my things and started down the tree, when I reached the ground I removed my safety harness and picked up my rifle and walked over the 30 yards where the buck laid. When I reached the buck I was amazed at the size of the animal. He had to go 330 on the hoof, and if he had rolled over any at all to his left he would have rolled into the 15 foot ditch. I called Justin on the radio and told him I had killed a nice 10 buck, Justin couldn't stand it any longer, he hadn't seen much so far this evening. He started towards me. about 10 minutes had passed while I was examining the buck and heard something and looked into the field behind me and there was a small 6 pointer looking around at 50 yards. While I was watching him I heard a deer snort, it was close. I turned around and looked into the bean field and there was a doe running away from me. I picked up my rifle and picked a hole through the brush to shoot when the deer stopped and looked back. I decided I would finish out my 2006 season on opening day. I touched off the 264 Winchester Magnum one more time, the deer flipped over backwards and got up and ran about 50 yards before that deer expired. Justin yells on the radio, "WHaT WaS THaT" I told him I just filled my doe tag, he says back to me you were suppose to save that for me. I want to shoot something also. I told him she would not have been here when he got here since she was leaving the country when I shot her. He replied well, ok then. Justin gets on the radio again, "dad, I see a nice buck, he is on the edge of the bean field." I turn around and the same 6 pointer is still standing in the bean field behind me. I tell Justin I think you are looking at a young 6 pointer that is behind me in the field; Justin said no, I think he is a good deer. Justin didn't have any binoculars so I told him to put his scope on him and see. So he did and replied your right he is a six pointer. By now I could hear Justin breaking brush as he made his way to me. Then I could see his orange jacket. Justin finally made it to me around 4:15 pm. I showed my buck and he was impressed with his size. I took out my digital camera and ask him to take some pictures of me and the deer. We both set down our rifles and grabbed his antlers and drug him away from the ditch. I got him positioned like I wanted when Justin said "DEER," I asked where; behind you in the bean field. I turned my head slowly towards the bean field and there stood a real nice buck. It was standing right beside the doe that I had killed 15 minutes earlier. I could see the buck better than Justin, I told him that he was a shooter and to pick up his rifle and come here. Justin picked up his rifle and came over by me. I told him to use the little sapling to steady his shot with. The buck was walking almost straight to us in the field, 100 yards 90, 80, 70 Justin was switching from side to side on the sapling, and Justin couldn't make up his mind on which side up the sapling offered the best shot. But the buck has now caught movement and has turned around and started walking back the way he came. I told Justin to quit moving and to get ready. The buck stopped and turned broad side. I asked Justin do you have a clear shot, I got my answer, his 270 roared and the buck dropped in his tracks. Justin unloaded his rifle and we decided to wait on my pictures and made our way through the deep ditch and to the bean field. as we are walking up to the buck I asked Justin how many points does he have, Justin didn't know, and I wasn't sure either, we both hoped it had 4 points on one side to make him legal. I was positive it did have or I wouldn't have told him it was a shooter. As we got closer the buck's rack seemed to grow. NO Ground shrinkage on this one. He was for sure a shooter. 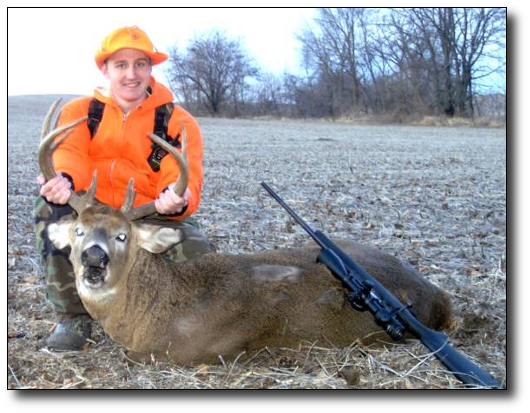 He was a fine 10 pointer. We positioned his buck since we were out there and took his pictures and then made our way back to my buck and took my pictures, then headed back to camp with our stories. after getting back to camp and telling our stories Justin, Kelly, Bob and I headed out in the Mule to recover the deer Justin and I had shot. Justin's was easy to get to and my button buck was easy they were about 10 yards apart. We loaded both of them, now we had to find away across the ditch and retrieve my buck. We had to travel up the ditch line about - mile and found a crossing that the farmer uses with his farm machinery and headed back to my deer. Justin and I had a short drag. I was sure glad of that. Then it took all four of us to load this toad in the mule. after getting him loaded we all got our pats on the back and headed back to camp to field dress the deer and hang the deer up for the night. Justin and I would head back home to spend some more time with our families. This was a great way for a father and a son to spend some quality time together. I hope we have many more years to do this with each other. We are planning an alaskan moose hunt in 2007, wish us luck.